Recently I bought a new wallet from Rue La La. It's by Chocolat Blu and just a clean, crisp black. I usually would have gone for a color but decided to be conservative and classic in my choice this time. I eagerly awaited it in the mail, and when I got it was delighted at the leathery smell and clean design. Then I put all my stuff in it and to my dismay, it looked so stuffed and fat that I took everything out and considered sending it back. I mean, it wasn't going to work for me, was it? After some inward thought about my wallet full of cards, I started thinking it was time to declutter this area of my life too. Why is it necessary to be dragging around all these things with me? In the spirit of full disclosure and shame, I'm going to list what was in my wallet. Can you believe this? Is this a Dave Ramsey nightmare? We don't carry any debt on any of these credit cards, but I had to ask myself why it is necessary to have all these on me at all times. I am not often unprepared when asked to produce something as you can imagine and, believe it or not, I'm having a hard time whittling this list down to fit all neat and tidy in my new wallet. In an effort to become who my wallet wants me to be, I have been evaluating all these categories and making decisions to simplify my financial life. I found there are sentimental attachments to these cards, just like everything else we try to declutter. There are personal associations that I feel by having cards to certain stores. That is how they want us to feel! I have been sure that there is an advantage to being a part of this store by having their credit card because they send me catalogs and coupons. As far as Talbots and Ann Taylor, I hardly ever shop there. I have already taken action to reduce this credit clutter. I canceled my Ann Taylor card with the touch of a few buttons. Yesterday I said bye bye to my Wachovia checking account and debit card which I never use. It was my first checking account in college which is probably what kept my loyalty all these years. G had a Saks card that he canceled but wasn't in my wallet. Yay for progress! We have the Chase Freedom card which gives you cash back, and used to make all our purchases on that card. For the last 8 months or so we have been weaning ourself off of using it because it June they will start charging an annual fee. I don't have any problem canceling a card that charges me just for having it! Even though we paid it off every month, using a credit card still makes you spend more money. There is something very real about using cash to pay for things. You don't let go of it as easily and may think twice about a purchase. On Sunday, we were at the Columbia store looking for outdoorsy clothes for our trip to Israel coming up. I had four things that I was going to buy and they came to $130. I asked G how we were going to pay for it and he said we should try to not use the credit card. That means that I have to use my allowance for these clothes. I ended up putting one jacket back, using the cash I had in my wallet and then writing a check for the rest. We definitely reconsidered every item right there at the cash register when I realized I wouldn't be using the credit card. One card that we won't be canceling is the Banana Republic. We shop there a lot and find a lot of value in it. We get free hemming alterations on all our pants we buy, free shipping with online shopping, and a lot of promotions for cardholders. Gustavo is so slim that their clothes fit him best and I love dressing him from there. The customer loyalty cards are quite bulky and when it comes down to it, you can give them your phone number. The CVS card, I had on my key chain and in my wallet. It's just amazing to me how I comply with these marketing strategies. Because of this CVS card, I certainly shop there rather than Walgreens. There are other reasons to not be carrying around all these items in your wallet, financial reasons and logistical ones. If my wallet got stolen, I would have to remember all these things were in my wallet, and make a ton of phone calls to cancel and replace. What if I forgot one that I rarely used like my Wachovia debit card? I think that making changes like these have to happen from time to time. What used to work for us may not be working anymore. Sometimes just leaving it alone seems easier which was certainly the case for me. I'm so happy that this little wallet has come into my life to expedite these changes. I'm not sure I would have done it otherwise. I will think twice about accepting a 10% discount to open a store charge card. Sometimes it really isn't worth the complication that it causes. It's another bill that you have to remember to pay. Hey, sometimes it is worth it but that's not for me to decide. Sometimes 10% is a lot! Maybe cancel the card after you get the discount. Then again, you have to consider that your credit is being hit by opening the card, so if you are buying a house or need your credit score to be high, it's not worth it. What do you think about simplifying your finances? What do you do to make your life less complicated. 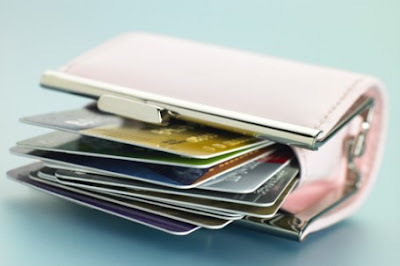 Is your wallet fat and stuffed like mine, or mainstreamed and uncluttered? Want to send me a picture for inspiration or share in my shame? Do tell! Picture from here. This is not my wallet by the way! I love the way you write. You are inspiring to say the least. I clean out my wallet once a week from receipts and coupons. This is one area I tend to stay on top of. I only have two credit cards, two insurance cards, DL, check book and babies r us reward card (which i use a lot for diapers). Oh wait, I did just find an expired national parks pass. OK that's trash. Thanks Sara! Your wallet sounds so streamlined. I'm glad I'm getting on the bandwagon now. You know I didn't even mention all the receipts I have stuffed in there! That is so you to have a national park pass in your wallet! This is a really good post! For the past three weeks I went on a cash only system Dave Ramsey style and I have to say it keeps me on budget and like you said I consider every purchase carefully! It helps that I'm also not buying anything new during Lent that I don't need, but it's helping me set boundaries like never before. You can easily keep those extra cards in your home in a drawer and take them out when you need the. Plus it will reduce impulse buys too! You know what I do keep in my wallet...prayer cards. It may sound hokey but just a couple of them make me feel a little "protected" if I have them on me and I can pull them out and read them if I'm having a rough day. I only carry my debit card and license and medical insurance cards, oh and car insurance with me. I've been meaning to tell you that I still use Fabuloso! and it's all because of that post you did a long time ago. I love it. It lasts forever and I've quit buying random cleaning products and it has simplified my cleaning arsenal greatly! I am afraid all that I would find in my wallet if I took an inventory. It would be best if I cleared it out some. And, like you, CVS' generous reward program keeps me going back. Almost every time I go there I leave with a $5 off coupon. I love a reward program that actually offers a real reward. Bonjour Madame-That is so cool that you still use Fabuloso! It smells great and when I am in stores and they clean with it, I recognize it right away. Those are great tips for my wallet. I love the prayer card idea too. I've been working on paring down and will hopefully transfer the less cluttered masses to my new wallet soon. Belette, Why can't I imagine your glamourous self at CVS? I only see you at fancy department stores and J. Crew. :) CVS is great though and they keep you coming back. It's funny that as many times as I've given a rewards card at a grocery store, not once have I ever seen a reward. Have you dared to take an inventory of your wallet out of curiousity? I'd love to see that list! I should do a post with my list of lipsticks I carry around.